The business world is witnessing a change, it is shifting towards a Digital Economy, where the reliance is more on the Internet, advanced technologies, mobile, cloud, big data and social media. The ways businesses interact or communicate with customers, conduct their operations and deliver experiences have also changed. Mobile, web and IoT applications are taking the driving seat now. These applications support concurrent users, handle several unstructured data, usually have no downtime, deliver responsive experience to users and adapt to new requirements, new features and updates, fast. And, for developing these applications, enterprises rely on agile methodologies and no sql database. Since 1960s NoSQL database has existed, but its popularity surged in the early twenty first century. Carlo Strozzi used the term NoSQL in 1998. However, in 2009 Johan Oskarsson reintroduced this term. For real-time and big data applications, NoSQL is now being increasingly used as the relational databases could not adapt new requirements of enterprises. As per few reports enterprises that have already implemented NoSQL for complex applications are- GE, Tesco, Marriott, Ryanair and Gannett. 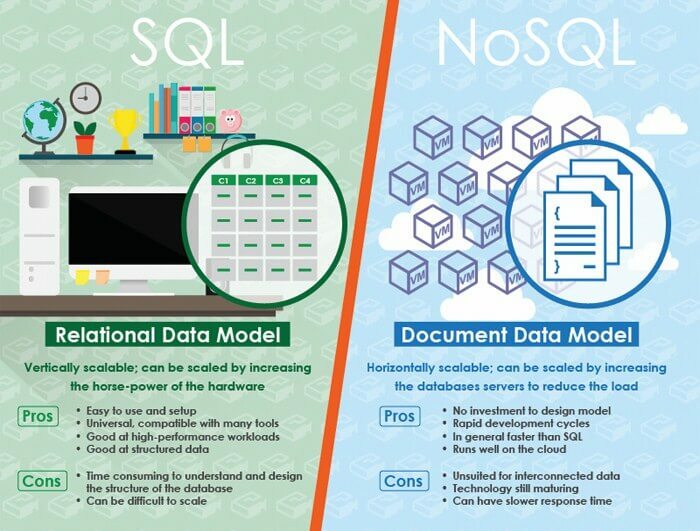 So what are nosql databases? NoSQL is a new take on database that is different from the traditional RDBMS or relational database management systems. This database does not rely on structures, but use, flexible data models. NoSQL is used for storing unstructured data like session and user data, log data and device data. Various database technologies are used for NoSQL to meet with the modern and complex applications suitable for enterprises. Applications need to handle huge volumes of new structured, unstructured and semi-structured data. The agile sprints have replaced waterfall development cycle, which iterates faster, pushes the code fast and multiplies. Earlier applications had a limited audience, but now it is accessible from different devices and can be scaled up as per the need of users. Enterprises now use open source software, cloud computing and commodity servers rather than monolithic servers. RDBMS or relational database management systems failed to cope the challenges and has paved the way for nosql introduction in modern enterprise application development. What is a Relational Database- Relational Database dates back to the age of the mainframe when the enterprises did not have reliance on big data, cloud computing, mobile and internet. First commercial implementation of relational database was in 1970s. Then the database ran on a single server. SQL or Structured Query Language is used to maintain this database. For increasing the capacity of database the only way is to upgrade servers- scale up memory, storage and processors. The no sql database came into being to meet the challenges that applications faced with relational databases. Applications to stay competitive need to be innovative, agile and fast. The ability to adapt to a new requirement is the key to agile development. The relational database is a roadblock to agile development as there is fixed data model and a static schema defines it. For changing the data model, developers have to alter schema in the database and this slows down the development process. But, a no sql database supports agile development. The data model is determined as per the application model. The no sql database supports IoT, web and mobile applications of any scale. It differs with a relational database in four areas. Data Structure– NoSQL database is designed to handle volumes of unstructured data In comparison to relational database which are capable of handling only structured data. Data Model– Unlike relational databases, NoSQL does not require any pre-defined schema, which makes it easy to update data as per changing requirement. Development Model– NoSQL is an open source so it does not require any licensing or upfront fees. Scaling up– It is easy to scale up a NoSQL database, you can use commodity servers for up gradation and not a single server like relational databases. These reasons have led to the popularity of the NoSQL databases. Small businesses, startups and enterprises rely on no sql database to develop applications that assure high performance and efficiency. To support specific use cases and needs, different types of NoSQL databases are created and these are categorized into four categories. Key-value database– This database emphasizes on simplicity and it is one of the least complex options. Since the data consist of indexed key and value, the database has received its name. This database is effective for applications that deal with non-transactional and high-velocity data. Dynamo DB, Berkeley FB and Aerospike are example of a key-value database. Wide-column database– The database is designed for storing data in tables as columns rather than rows. A query retrieves relevant data from the columns. However, in RDBMS data is present in various rows and the retrieval requires multiple operations. Wide- column nosql example are HBase, Cassandra and BigTable. Document database– It is similar to a key-value database but here the value is a single document and stores data related to specific key. 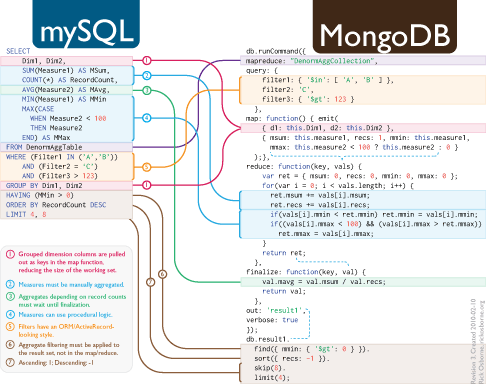 Two popular Document nosql example are CouchDB and MongoDB. Graph database– The database uses graph for storing query relationships. Titan and Neo4j are two examples of this type of database. Performance– Applications can deliver good user-experience for better return on investment with a no sql database as it increases the performance. Scalability– Methodology used by this database helps in scaling up or down the capacity depending on the requirement of the enterprise. Data Modelling– This database has no restrictions regarding data models. It allows applications to iterate fast. Big Data– Big Data plays an important role in the enterprise-level applications. The no sql database can handle volumes of big data easily. In the database ecosystem, NoSQL is now becoming increasingly important. However, for choosing the right database, an enterprise need to consider the issues like data characteristics, application development process and operational issues. I have been tracking NoSQL databases since early 2012, collecting publicly available data on skills and vendors. The NoSQL market is still tiny. Considerations and summary of data in Section 2 of this very large slide deck: https://speakerdeck.com/abchaudhri/considerations-for-using-nosql-technology-on-your-next-it-project-1 Slides regularly updated with new data as I find it. Data last updated in August 2016. Thanks for sharing this useful information, Great article posts!!!! !